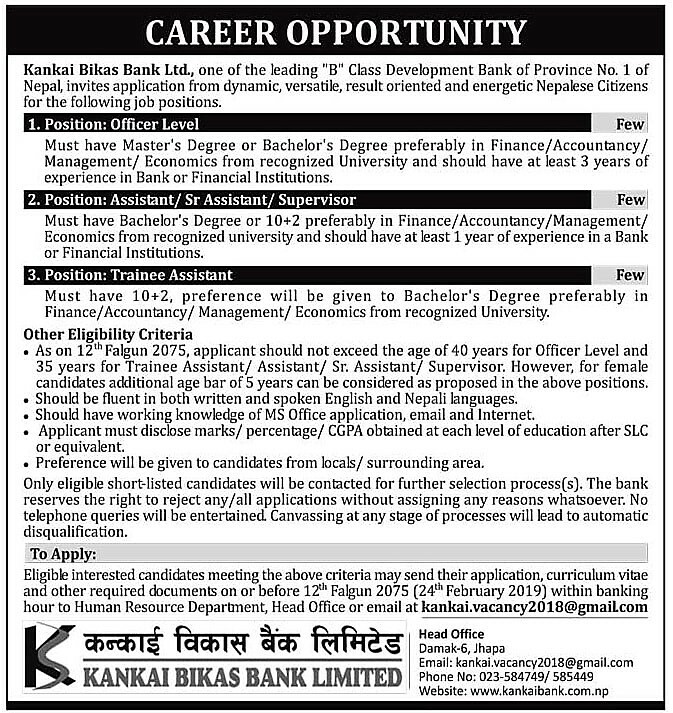 Home / Banking jobs / Vacancy / Career Opportunities at Kankai Bikas Bank Ltd.
Career Opportunities at Kankai Bikas Bank Ltd.
Kankai Bikas Bank Ltd., one of the leading "B" Class Development Bank of Province No. 1 of Nepal, invites application from dynamic, versatile, result oriented and energetic Nepalese Citizens for the following job positions. Must have a Master's Degree or Bachelor's Degree preferably in Finance/Accountancy/ Management/ Economics from recognized University and should have at least 3 years of experience in Bank or Financial Institutions. Must have Bachelor's Degree or 10+2 preferably in Finance/Accountancy/Management/ Economics from a recognized university and should have at least 1 year of experience in a Bank or Financial Institutions. Must have 10+2, preference will be given to Bachelor's Degree preferably in Finance/Accountancy/ Management/ Economics from recognized University. As on 12th Falgun 2075, the applicant should not exceed the age of 40 years for Officer Level and 35 years for Trainee Assistant/ Assistant/ Sr. Assistant/ Supervisor. However, for female candidates, an additional age bar of 5 years can be considered as proposed in the above positions. Should be fluent in both written and spoken English and Nepali languages. Should have a working knowledge of MS Office application, email, and the Internet. Applicant must disclose marks/ percentage/ CGPA obtained at each level of education after SLC or equivalent. Preference will be given to candidates from the locals/ surrounding area. Only eligible short-listed candidates will be contacted for further selection process(s). The bank reserves the right to reject any/all applications without assigning any reasons whatsoever. No telephone queries will be entertained. Canvassing at any stage of processes will lead to automatic disqualification.